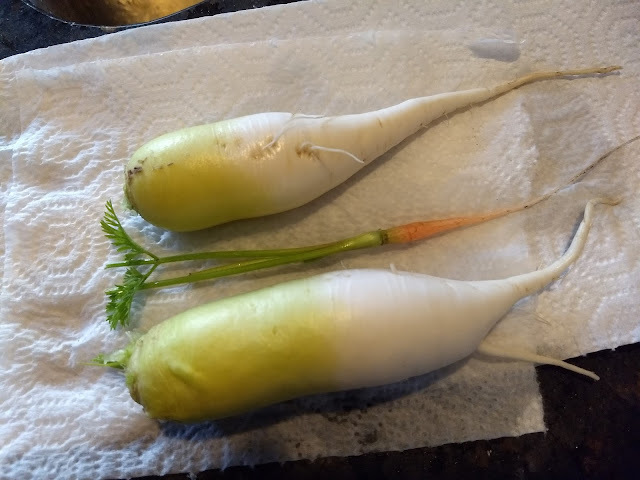 The daikon radishes shown above are volunteers from a spring crop. They grew bigger in the spring, but these are still a decent size. Recently, the deer have discovered the crop and are munching away at the top growth, so I don't know if the roots still in the ground will get much bigger. The carrots were sown in September. I've since learned that University of Tennessee does not recommend carrots as a fall crop here. If I want to try them in fall next year, I'll probably try sowing a month earlier and try to do a better job thinning out the seedlings.